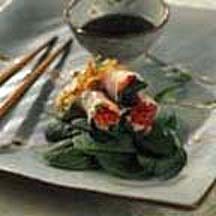 Lobster meat rolled with grilled shitake mushrooms, stir fried greens, and asian herbs in a rice paper wrapper, served warm, drizzled with sesame, ginger and lime. For Rice Sheets: Combine rice flour, water, and salt in a mixing bowl and beat well with a whisk. Strain to remove any lumps (batter will be very watery). Set aside for at least 30 minutes. To make the rice sheet, fill the banh cuon pot with 2/3 full of water. Tighten the cloth over the hoop and place the hoop in the pot. Cover and bring to a vigorous boil. Place filling, oil, and cookie tray near the stove area. Stir the batter well before making each rice sheet. Using a shallow ladle, spoon 2 tablespoons batter into the center of the cloth. Using the bottom of the ladle spread the batter into a 6-inch inch wide circle. Cover and steam until rice sheet is translucent and floats on top of the cloth, about 40 seconds. Working quickly, lift the rice sheet off with a flat bamboo stick or a thin rubber spatula and transfer to the oiled tray. Repeat with remaining batter. Let rice sheets cool before filling them. For the Filling: In a medium size bowl, combine 2 tablespoons of vegetable oil, the ginger, and the green onion. Season with salt and pepper. Add the mushrooms and gently toss to coat. Preheat a grill. Grill the mushrooms until tender. When cool enough to handle, slice 1/4-inch thick. Adjust seasonings. Keep warm. Heat the remaining oil in a frying pan over moderate heat. Add shallots and stir 20 seconds. Add the garlic and ginger, sauté 10 seconds. Mix in the Tatsoi or purple mustard, fish sauce, sugar, and white pepper. When the greens wilt, adjust seasonings with salt and pepper transfer to a bowl to keep warm. Heat the lobster over low heat in a sauté pan. To make the rolls, fold up the side of the rice sheet closest to you. Neatly place 1 1/2 teaspoons of wilted greens, 2 strips of mushrooms, and 1 slice of lobster filling on the folded area. Fold the sides over and roll into a cylinder. The rolls should be about 2 1/2-inches long and 2/3-inch wide. Can be made in advance up to this point. You can store in the refrigerator up to 2 days. Before serving, reheat in the microwave or steamer. For Sesame-Ginger-Lime Sauce: Place the garlic, chiles, and ginger in a mortar and pound into a paste. Transfer paste into a glass jar with a tight-fitting lid and add the remaining ingredients. Mix well until sugar is dissolved. To serve, pour into small ramekins. Sauce may be stored in the refrigerator up to 2 weeks. To Serve: Divide the rice rolls among four plates. Top each plate with 1/4 of the bean sprouts, mint, basil, and shallots. Drizzle with a generous amount of Sesame-Ginger-Lime Sauce. Makes about 20 to 24 spring rolls. Recipe provided courtesy of Maine Lobster Promotion Council.